The Superleggera features a low ride height for better handling, a unique interior, and has been designed from the start to be a sports car. It’s not quite as exciting as a Beatles reunion, but it looks like one of Britain’s greatest hits -- the affordable sports car -- could finally be returning. England’s Car magazine is reporting that BMW officials have approved for production the Mini Superleggera concept car, which debuted last year. The tiny, low-slung two-seat roadster, Car says, will go into production in early 2018. There is no word yet about the car coming to the U.S., but it would have to be sold here to justify output. The current Mini Roadster is not a sports car. It is the Mini Cooper hardtop transformed into a convertible. The Superleggera has a lower ride height for better handling, a unique interior, and has been designed from the start to be a sports car. There have been other mass-produced affordable British sports cars since that time, such as the MGF and MG TF, but those cars were not sold in the U.S.
Sports car purists may have an issue with the Superleggera’s underpinnings. Since the car is based on the Mini Cooper, it will have front-wheel drive. And that has been a deal-breaker for traditional sports car buyers in the past. Ford’s Australian-built and Mazda-based 1991-94 Mercury Capri roadster failed. So did the 1991 Lotus Elan. Both were front-wheel drive. Alfa Romeo tried a front-wheel-drive Spider convertible in the late ’90s in Europe and didn’t have much success. 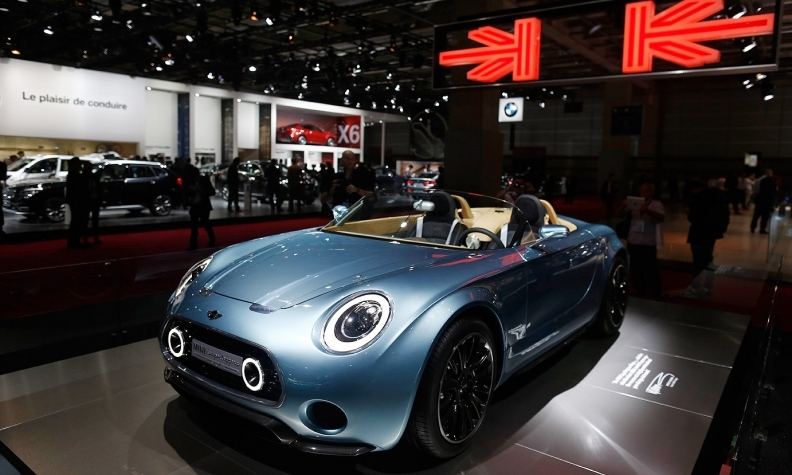 The Mini Superleggera is likely to be powered by BMW’s current 1.5- and 2.0-liter three- and four-cylinder engines. A hybrid is also possible. The new Mini roadster will have tough competition. Mazda is launching a new MX-5 Miata this year and is building a version for Fiat, both of which will be rear-wheel drive.